I had at least two chances of getting myself a Japanese magazine. Both of them were when I was in Taipei; both of them were when I was at the flagship branch of Eslite, the one in Dunnan, the one you likely know as that 24-hour bookstore. 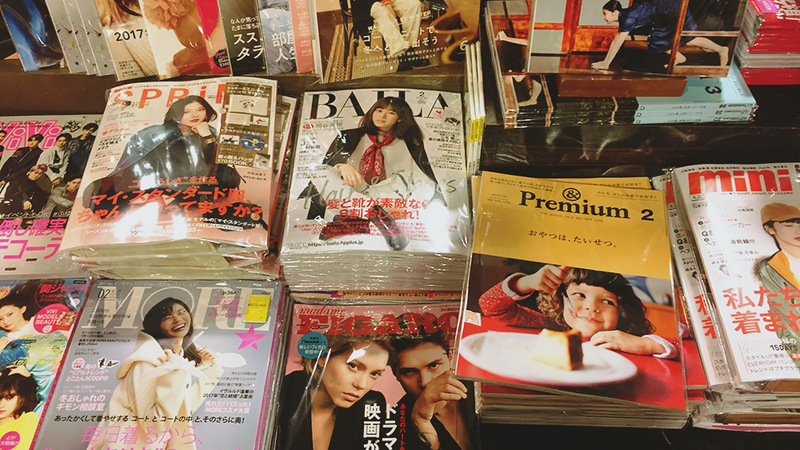 It has a lot of them - not a diverse range, mostly fashion magazines, but still, a lot of them - unsurprisingly for Taipei, a city that seems to embrace a lot of Japanese things without being outright Japanese. It's still got its Chinese character, but if you can't go to Tokyo, Taipei somehow is a good substitute. Why would I get a Japanese magazine? I want to see how it looks. The Japanese seem to do good-looking magazines, the way they do good-looking clothes and good-looking cities. I don't understand it, yet, but the Japanese seem to do good-looking everything. But really, why would I get a Japanese magazine? I wouldn't be able to read a single word of it anyway. I wouldn't call myself a Japanophile - or a weaboo, for that matter. I think it's too late for that. It's the sort of thing where you have to start young, immerse yourself early, perhaps learn the language along the way. (It's not like Korean, where it's much easier to pick up on the alphabet, although what those words mean are a different thing altogether. Not that I can read Korean now. Some characters, yes, but everything else is still a crapshoot.) But, from my vantage point, there's this sheen of cool from Japanese things that I really want to understand. I can never embrace it, but at least I want to get it. Also, as a guy who pretends to do good magazines, I might be able to get some design inspiration. But then I'll tear my hair out once I remember I cannot be the sole editor, writer, art director, designer, photographer and artist. That sort of look needs a team. I have, somewhat. I have seen scans, and I have flicked through those magazines while at Eslite. I think of buying them, but then I dither, until I don't, because I feel like spending money on magazines I will never be able to read is never going to be a good deal. But then, I enter the rabbit hole and feel a tinge of regret, like tonight. I don't know. It must be the letter spacing. It must be the nature of Japanese alphabets. It must be the weather, of how every photograph I've seen from Tokyo looks good, the same way my photographs from Hong Kong these past few years look good, especially when the skies are overcast, especially when I use the right curve from Shalla's old presets. (But then, in some cases, my friends who have studied the same classes as I have took them.) In that case, I should have bought some Korean magazines too when I was in Seoul, but to be honest, it doesn't match up. Same with Chinese magazines, or at least the few I've seen in Hong Kong. See what I meant about a rabbit hole? What do the Japanese have? Some (I'm pretty certain it's a Monocle article) say it's because the Japanese were raised to appreciate quality craftsmanship, so they tend to not settle for less, choosing to pay more for something that they know has been produced well. (Come to think of it, Uniqlo may be fast fashion, but it is quite straightforward in how well it works.) They've been raised knowing that good things take time, effort and perhaps a lot of lessons along the way - think of your favorite quest anime. Same applies to their magazines, with the attention to detail and just that little extra twinkle, that little extra love. Perhaps Japan's exquisitely cool image - to outsiders, at least - comes in too, swaying us towards one direction or another. I don't know. All I know is, I cannot understand it, and yet it's alluring, and yet I cannot understand it. Partly because I tweeted her about it, Adette has offered to get me some Japanese magazines when (not if) she returns there. "As long as Arashi's not on the cover since those sell out easily," she said. At least she gets to go there regularly. Shalla and I have been planning, but frankly, I am anxious about not getting a visa, or enough money, to do that. It may be more practical than a magazine I cannot read, but it's not any easier to attain. But if I go there, I'll definitely buy a bunch of magazines, and I will not read them, because I can't. I probably won't.